MMS/aidsfocus.ch participated at the 36th Global Fund Board Meeting from 16-17 November 2016 in Montreux - Efforts to Increase Impact in the Fight Against TB and MDR-TB is Urgent and CSOs call for urgency of operationalising the policy of sustainability, transitioning and cofinancing. The amount of money available for country allocations for 2017-2019 is 10.3 billion USD. This amount includes 1.1 billion USD unutilized funds from the 2014-2016 allocation period. 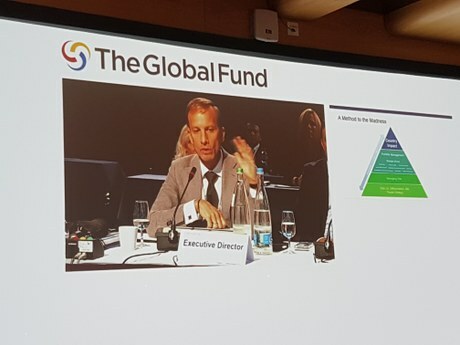 When the Global Fund announced that the countries pledged 12.9 Billion USD at the 5th replenishment conference it used a five-year simple moving average (SMA) to convert pledges made in local currencies into U.S. dollars. Civil Societies at the Board meeting raised concerns with regards to the amount of funding available. Are we on track? Can we fulfil the objectives as set out in the Global Fund Strategy and reach the targets with this amount? The allocation methodology is geared towards countries with high burden of disease and low income status. Several countries will face drastic funding gaps with the new allocation methodology approved in the 35th Global Fund Board meeting. UNAIDS, the Stop TB Partnership, and Roll Back Malaria estimate that even with a 13 billion USD Global Fund contribution, and even after accounting for contributions from other external funders and domestic investments, “there is a gap of $20 billion between available resources and global need.” The Developed Country NGO Delegation recommended that the Secretariat develop an ambitious strategy to mobilize additional resources for the 2017-2019 replenishment cycle. One of the major themes in the Executive Director’s Report is that multi-drug resistant TB is creating a real threat to global health security and now is the time for a rapid and urgent response. Figures from the WHO show that TB is now the leading cause of death, killing 5000 people a day. The disease has become a public health crisis as more people die from drug-resistant TB than any other antimicrobial resistant agent- India, Indonesia, Nigeria and Ukraine (Global Fund eligible countries) have the largest number of estimated cases of MDR-TB. The Eastern European region has been highly affected by MDR-TB. In fact, the region has some of the highest rates of drug-resistant TB in the world. The Global Fund is and will facilitate MDR-TB funding through direct investments and through partnerships. CSOs call for urgency of operationalising the policy of sustainability, transitioning and cofinancing adopted at the last board meeting in April. There is a significant impact that donor withdrawal can have and has had in countries facing or undergoing transition away from donor resources. Stakeholders must take action to ensure the transition is responsible and does not put the sustainability and continuity of programs and services at risk. Which is the case for several countries. These efforts must be driven by the countries themselves with Global Fund support, and begin well in advance of Global Fund’s withdrawal. Eastern European countries (e.g. Bulgaria, Romania, Montenegro) face drastic funding cuts from 2017 onwards in countries where transitioning was not funded. CSOs call for action from the donors to continue funding these countries to allow a faire transition period -Gains must be sustained! The Board requested that the Secretariat, under the oversight of the Audit and Finance Committee (AFC), develop an ambitious plan for attracting additional resources. The Board said that the plan, which may include providing additional pledging opportunities for donors, should maintain visibility of both unfunded quality demand and progress in achieving impact. The Board asked that the plan be shared with the Board at its 37th meeting, and be subsequently reported on by the AFC to the Board on a regular basis. Decision Point GF/B36/DP04: Approval of the Amended and Restated Comprehensive Funding Policy. The Board approved an amended and restated Comprehensive Funding Policy. The revised policy includes a description of the methodology for portfolio optimization, including clarification that during an allocation period, new funding may become available due to additional pledges and contributions; unutilized funds from a grant from a previous allocation period; and forecasted unutilized funds from grants in the current allocation period. The Board decided that the amount of sources of funds for allocation for the 2017-2019 allocation period is $11.1 billion, of which $10.0 billion is derived from the 5th Replenishment and $1.1 billion represents forecasted unutilized funds from the 2014-2016 allocations period. Of the $11.1 billion, $800 million is reserved for catalytic investments, leaving $10.3 billion available for country allocations. Finally, the Board said that of the $10.3 billion, $800 million will be used to ensure scale up, impact and paced reductions. The Board approved $800 million for catalytic investments. The catalytic investments can be operationalised through three distinct modalities: a) matching funds (356 million USD); b) multi-country approaches (272 million USD) and c) strategic initiatives (172 million USD). Matching funds will replace former incentive funding requests, making these investments more strategic. More details on catalytic investment priorities can be found under Catalytic investments (aidspan). The Board approved revised terms of reference for the E.D. position as well as the voting procedure for the selection of the next E.D. The Board has formally launched the recruitment process for a new executive director to replace Dr Mark Dybul, whose term expires on 31 May 2017. Dr Dybul has indicated that he is not seeking a renewal of his term. The Board approved a corporate work plan and budget narrative. The Board also approved a 2017 operating expenses budget in the amount of $300.0 million, which included $17.1 million for the expenses of the Office of the Inspector General. Board member discussed proposed performance targets recommended by the Audit and Finance Committee and the Strategy Committee for 2017-2022 but did not adopt them. Instead, the Board requested that: (a) Board constituencies submit statements, questions, concerns, or suggested revisions regarding the performance targets, including how country-level information or estimates will be considered, to the Secretariat by 30 November 2016; (b) that the Secretariat provide a response by 9 December 2016; (c) that the chairs and vice-chairs of the Audit and Finance Committee (AFC) and the Strategy Committee (SC) determine the performance targets to be addressed by each committee; and (d) and the chairs and vice-chairs of the AFC and the SC establish a joint-committee advisory group to work with the Secretariat to present by 9 December 2016 revised performance targets for the Strategic KPI Framework – based on country-level estimates where relevant and available – to the AFC and SC for recommendation to the Board by the first week of March 2017. Medicus Mundi Switzerland is part of the Swiss Delegation within the Canada, Switzerland and Australia constituency representing the civil society at the Global Fund board meetings.